Need to Make a Complete Thanksgiving Meal on a Budget? We’ve Got Your Back. Thanksgiving is a time to cut loose and indulge a bit — unless, that is, you’re on a tight budget. This being 2018, tight budgets are the name of the game. But that doesn’t mean you can’t celebrate the holiday in style. We’ve combed the internet for the best and least expensive recipes for a few indispensable Thanksgiving dishes that will leave you full, thankful and not (more) broke. Former country star and current lifestyle guru Trisha Yearwood has the easiest turkey recipe ever. Here’s what you need: butter and a turkey (plus salt and pepper, which you have anyway). Preheat the oven to 500 degrees. Rub butter all over the turkey (inside the cavity, too) and coat it liberally with salt and pepper. Let the turkey hang out for about 30 minutes, then put it in an assembled, covered roasting pan (boiling water in the bottom) in the 500 degree oven. Roast for an hour, then turn the oven off and let the turkey keep cooking as the oven cools (don’t open the oven, you’ll blow it). This will take 4 to 6 hours but by the end your turkey will be done. Let the turkey rest for 30 minutes then carve and it serve. It’s that easy. Thanks, Trisha. This stuff ain’t gotta be that hard. This recipe is from the homies at McCormick. It has four ingredients and half of them come in cans. Super affordable, but totally great-tasting! Stir together the soup, milk, beans and half the onions. Season with pepper to taste. Bake for 30 minutes at 350 degrees. Take it out, add the onions on top, and bake for 5 minutes. That’s the recipe. Why don’t we do food stuff all the time? Mashed potatoes are easy to mess up. They can be too chalky, too watery, over salted or the absolute worst—too bland. But these mashed potatoes are, for the most part, foolproof. This recipe came straight out of the recipe book of one of our staff members (OK, fine. It was my mom’s, okay? ), and they’re the freaking bomb. Food for thought, though: If you’re going for a healthy-ish alternative… this definitely isn’t it. Place peeled and diced potatoes in a pot with a tablespoon of salt—the more sodium, the better. Cover with water and boil. Remove lid partially and simmer until potatoes are tender, then drain. Combine all ingredients into a mixing bowl and beat until smooth. Return mashed potatoes to the pot and add more milk as necessary. Season with salt and pepper, then boom. Best mashed potatoes ever. We’re all about the carbs here. Don’t get us wrong, we love a good sweet potato casserole as well, and there’s no reason that both dishes can’t make their appearance on your Thanksgiving table. This sweet potato pie recipe comes from Paula Deen herself, so you know it’s about to be a good one. It may seem a little long, but don’t let that scare you. It’s actually really simple. Whew! It sounds like a lot, but most of these items are under $5, and the rest are things you probably have lying around your kitchen cabinets in that back corner that you need to clean. First, cream the sweet potatoes with a mixer. Preheat your oven to 350 degrees F. Now, onto the best part: the filling. In a large bowl, combine the potatoes, 1 cup of the sugar, butter, eggs, vanilla (or bourbon), salt and spices. Add the milk, stirring until well combined. Pour this mixture into the pie crust and bake for about 45 minutes, or until a toothpick inserted into the middle comes out clean (an old trick). Let the pie cool to room temperature while you make the best best part: the meringue. Beat the egg whites, beat in the remaining ¼ cup sugar, 1 tablespoon at a time. Continue beating until the sugar dissolves and the mixture is glossy and stiff, but not dry. With a rubber spatula, spoon the meringue mixture onto the pie. Make sure it fills the crust all the way around. There’s nothing worse than getting a piece of pie with only half the topping. Sprinkle the whole thing with just a pinch of sugar, then bake for about ten minutes. Your great aunt probably has a secret family recipe for stuffing and we’re not going to tell her her own business. But if you’re on a budget and have no inexpensive family recipe to work with, here’s the easiest hack of your whole meal: Kraft’s Stove Top stuffing is famous for a reason. Ever since 1972, when its recipe was developed by an Indiana native named Ruth Siems, it’s been a Thanksgiving staple to rival even the most meticulously crafted traditional stuffing. A box of it costs less than two dollars. The instructions are so easy your dog can handle them in a pinch. If you’re collecting recipes to tee up the perfect friendsgiving, good for you! It’s always great to be that friend. Just make sure you have everything you need to keep your budget in tact. 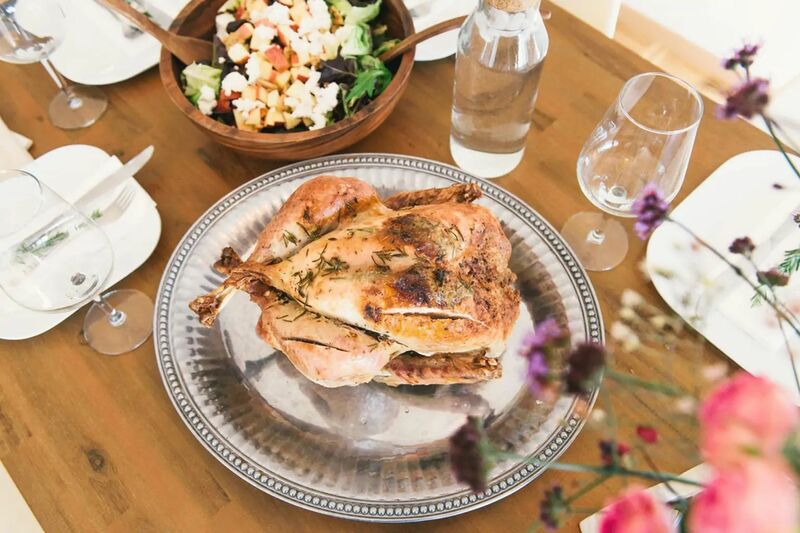 Here are more tips for a memorable thrifty friendsgiving that you’ll never forget.